August 2017 – Most Hi-Tech Month Of The Year! 2017 year has seen a lot of development in technology. 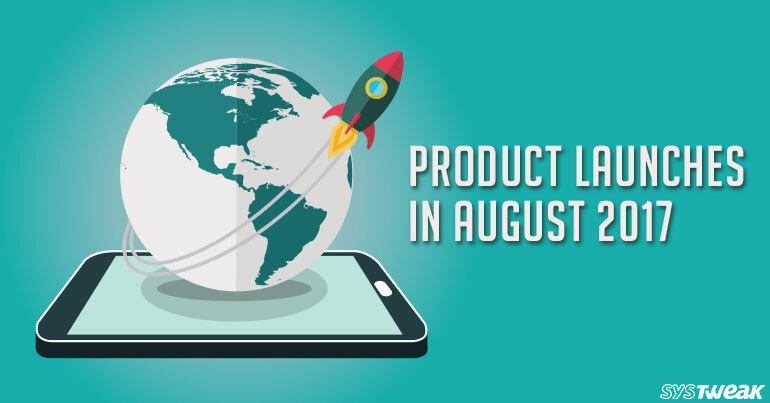 One of the amazing thing about the year 2017 is that the Month of August saw the launch or product extensions on each day of the Month. Which is quite amusing to the say the least! Here in this blog we will be discussing about all the 31 product launches and product expansions that took place in the Month of August 2017. Shopify has been in the software field for a long time now and this is the first attempt by them at hardware designing. Though it is a simple card reader but it has a unique approach that lets it connect wirelessly to your iPad, iPhone, or Android Device. It is an EMV-compliant credit card reader in which customers can insert or swipe their card and consequently sign in through the screen on your POS device. Firefox added a very useful feature to its software on this day of August. By clicking send, you can upload a large file (up to 1GB) and will create a link to it, which can be shared with people. The link will be active only for 24 hours or till any one person downloads it. After one download or completion of 24 hours the file will be automatically deleted. It is a credit card size mobile phone designed to reduce the use of the smartphones to the minimum. This device acts as an extended second phone for the people that works on the GSM network with the number you have irrespective of the tariff plan you have. Very fast processing speed and deliver results in near real time. Exporting and viewing the complete transcripts for every conversation. A website to help new professionals or freshers to make a better decision whether the offered compensation or equity is justified or not. Natalia Rodriguez and Matt Wallaert are the designers behind this website and the unique idea. They designed this after they helped a friend in evaluating and going through the hiring process. The trick involved is you would have to know the company’s valuation including the funding if any received. To be ahead in the competition every company needs to have an awesome homepage or landing page for their software and applications. DesignMunk offers help in the task of scrutinizing the best homepage designs till now and inspire you to do better than that. The content of the website is curated by Mohammad Tajim. It is a magnetic levitating lamp in the shape of cloud designed by Richard Clarkson of Brooklyn. This lamp has magnetic components which makes it float above the surface by 2.75 inches and when the base is powered the cloud shaped lamp levitates wirelessly and unconstructively. The device is lamp come a speaker system and the LED lights flash as per the beat of the music in four different styles. A mobile app for working couples to manage their finances in a better way and hence, reduce the number of money-related stress between them. With this app, couples can share all information related to account balance, spending, bill payments and can comment on individual expenses. This app was founded by Thien Tran and Eugene Park with the aim to keep both the partners on same page in context of money matters. The target customers of the app are the Millennials. On the 10th day of August 2017, Facebook launched a new platform for playing the original video content produced for Facebook. It is a platform where all the creators and publishers meet the right audience and community of fans and earn publicity for their work. Watch will be home for a lot of variety of show producers ranging from reality to comedy to live sports. The Watch could be personalized as per your liking and you can discover new shows organized as per what your friends are watching and what the different communities that you follow are watching. Certainly, August 2017 was quite an exciting month for the tech world. We talked of the first 10 days of it in this blog. Well, in the next blog we will tell you about the other days of this month. Subscribe to our newsletter to receive the next part of this blog in your inbox. What To Do When The Power Button On Your Android Phone Is Broken?